How to record video or snapshots to D-Link network storage device(NAS) when motion is detected? Step 1: Log into your camera through the web interface. Step 3: Select the Setup tab. Step 4: Select Event Setup on the left hand side. Step 5: Click Add under SERVER. Step 7: Select Network Storage and enter your Network storage information in the fields provided. Step 8: Click Save Settings. Note: Test can be used to verify a working folder path on your NAS. Step 9: Click Add under MEDIA. Step 10: Enter the Media Name in the field provided. Step 12: Click Save Settings. Step 13: Click Add under EVENT. 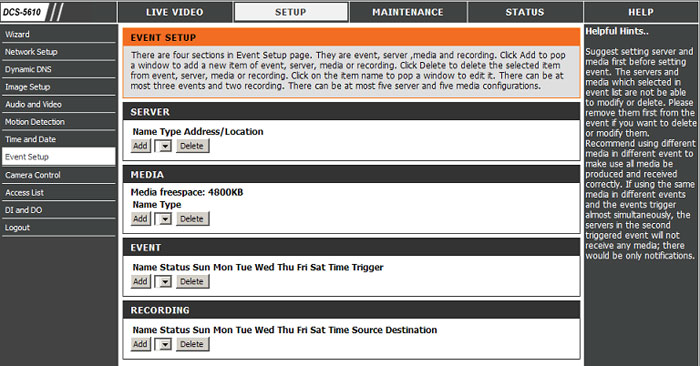 Step 14: Under EVENT enter the Event Name in the field provided and check the Enable this event box. 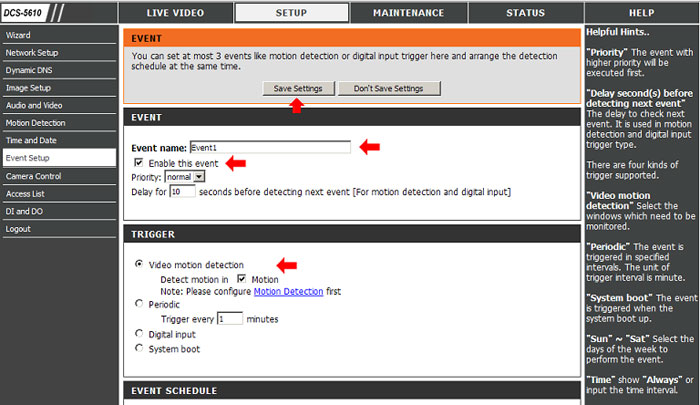 Step 15: Now under TRIGGER click the Video motion detection radio button and check “Detect motion in” box for the motion detection windows that will monitored during this event. Note: EVENT SCHEDULE is set to all the time by default. Step 16: Now under ACTION check the box for the server created in Step 6 and drop-down to the Media name created in Step 10. Step 17: Click Save Settings. 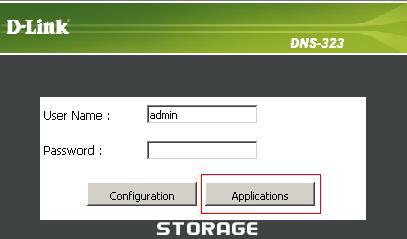 How to setup Scheduling on D-Link DNS-321-323-343 Network Storage? Select the appropriate login method to access the files for download. If the site requires login credentials, select Account and enter a valid username and password. Step 5: Click Test to test the URL is valid and the user name and password are correct. Note: When backing up from a local computer. file sharing needs to be setup to allow the NAS access to your files. 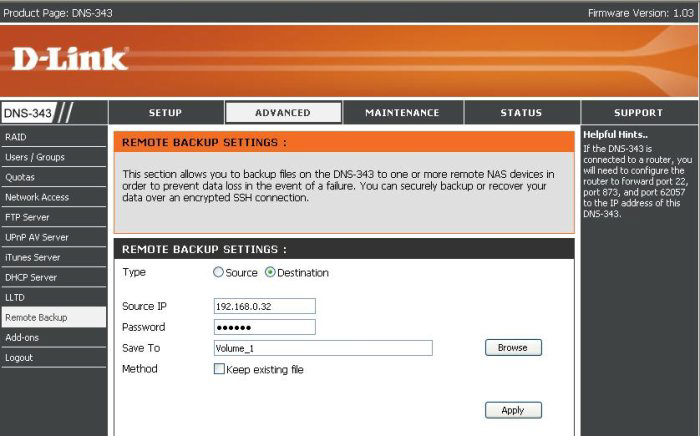 How do I setup Remote Backup using two D-Link DNS-343 Network Storage ? Step 2: Under the Source Share path, type in a name for your backup location, this can be anything, so for this example lets just use BACKUP Click Browse and locate the directory you wish to backup. If it’s the entire Volume_1 click OK and Apply button. 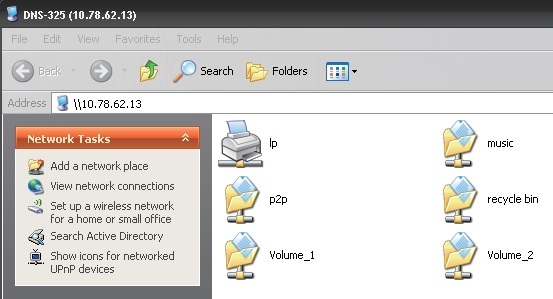 Step 3: Click the Start Remote Server button to turn on the RYSNC Sharing. Share paths will show up at the bottom. Step 4: Now on your Server Backup Unit (The unit your backing up your files to) Login to WEB GUI. SelectDestination, enter the IP address of the Server DNS-343 (192.168.0.32) in the source IP field. Enter thepassword you type in your Source box earlier. Step 5: Click Browse next to the Save To path (as shown above) and select the directory that you would like to backup to. Step 6: If you do not want to overwrite existing files make sure to click the Keep the Existing files checkbox then click Apply. Step 7: Once you have clicked Apply your Rsync Client should connect to your Source Server, If it has not connected please hit the refresh button on your browser. Step 8: At the bottom will be a Destination list, put a check-box next to the folders you want to back up. These should be the same folders/labels as you created on your Source . Once you have placed a check-box in the folder list, click the Backup button. Your backup should now be downloading from you server box. 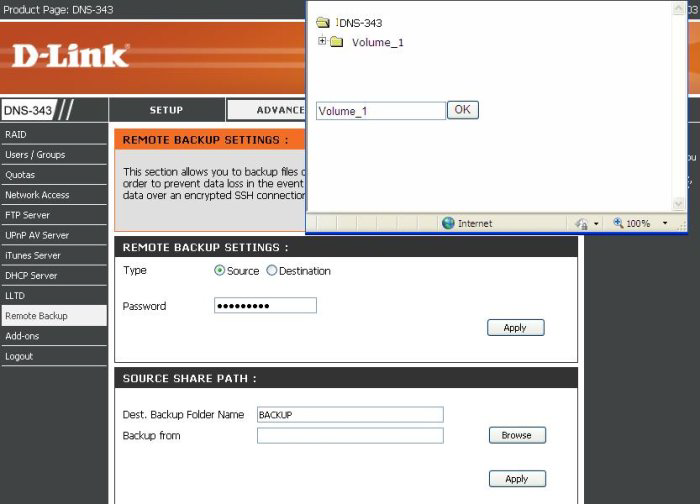 Remote Backups allows you to back up your device to another ShareCenter Pulse or Linux Server or vice versa from a remote ShareCenter Pulse or Linux Server to your D-Link DNS-320 device. 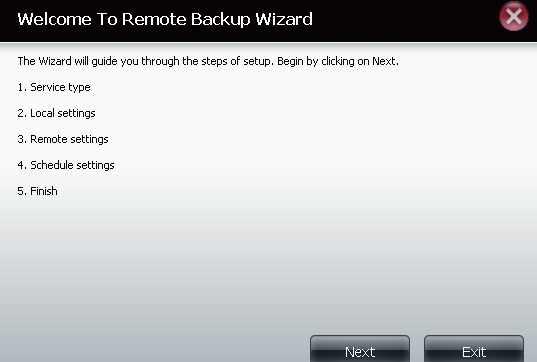 Click the Create button in the remote backups list to start a wizard where you can configure the Remote Backup functionality. Note: If you are going to backup from this NAS through the internet as the source content of the backup setting, then make sure that the Remote Backup Server is checked and set with a password. If the ShareCenterTM is connected to a router, you will need to configure the router to forward port port 22, 873 to the IP address of this ShareCenterTM. Check this box to enable the remote backup server functionality to that a remote NAS or Linux. Note: If you are not using the Remote Backup functionality leave this box unchecked so that your device performance will not be affected by the additional overhead used by this process. Password: Enter a password that the remote client will use. Create: Click the Create button to build a new remote backup job. Modify: Click to make changes to your existing Remote Backup jobs in the Remote Backup list. You must select the remote backup job first and then click the Modify button. Delete: To remove a Remote Backup job select the job in the list and then click the Delete button. When you click the Create Button above the Remote Backup list this wizard will launch allowing you to configure a new Remote Backup job. Wecome: Displays the steps of the wizard. 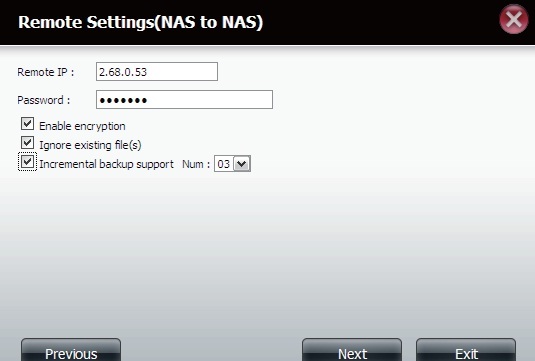 Service Type: NAS to NAS: Backup from the local NAS to a remote NAS or vice versa. NAS to Linux: Backup from the local NAS to a Linux file system or vice versa. Local to Remote: Sets the backup source as the local NAS and the target destination for the backup files as the remote NAS or Linux file system. Remote To Local: Sets the backup source as the remote NAS or Linux file system and the target destination for the backup files as the local NAS. Local Settings: Task (Name): The name used to refer to the backup job which will be listed later in the Remote Backup list. Folder Path: Select a local network share folder or file as the target or source for the backup job. Remote IP: The backup process uses Rsync protocol and needs to know the IP address of the destination source or target device for the backup. Input the IP of the remote NAS or Linux file system. Enable Encryption: Checking this box will enable SSH encryption of the files that are transferred (backed up) over the network between the local and remote devices. Ignore existing file(s): Checking this box prevents the backup process from writing over any files in the target file system that are not part of the backup files or folders. Therefore any existing files in the target system are preserved. Incremental backup support Num (#): Checking this box provides multiple backup-capability at scheduled times. The first backup in an incremental series captures all the files for backup. Subsequent backups are incremental in that only the files and the folders that have changed in the backup source since the last incremental backup will need to be backed up. Each incremental backup builds a complete snapshot of the backup source however only the initial backup contains all the original files and folders. The subsequent backups in the incremental series contain new files and folders plus the links to the first incremental backup. Remote Path: Using the drop-down menu, select the file system (folder) path to the remote target or source system for backup. Manual: Check either Yes or No selection below to start the backup (yes) immediately on completion of the wizard or (no) manually start the backup from the Remote Backup list. 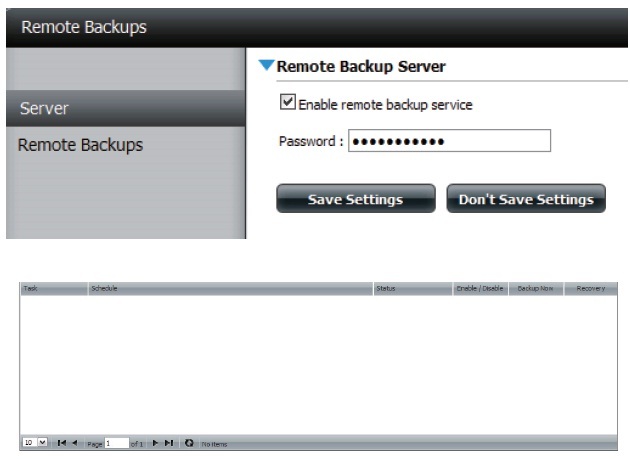 Once – Select this option to run the Remote Backup once at a specific date and time set. Scheduled: Select this option to set the backup to occur daily, weekly, or monthly per a specific schedule. The D-Link DNS-320 Network Storage USB Print Server features a built-in USB print server, giving users the ability to share a printer on their local network. Connect a USB printer to the USB port on the back of the device. It is important to ensure that any of the printer manufacturer’s drivers are already installed or available on any computer you want to print from. Note: Only the print function is supported. The device does not support the copy and scan functions of Multi-Function Printers. The printer should appear in your in the System Info menu of the Status icon. 1.Connect to your device with Samba and then double-click the lp icon. 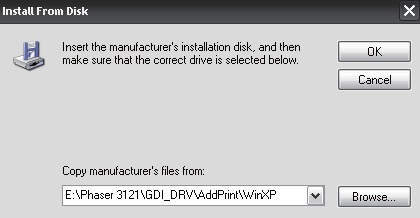 Select the printer driver from the installed Manufacturer list or use the Have Disk button to browse for the printer driver file. 3.Once you have selected the proper driver as shown in the browse list then click OK to install the printer. 4.The printer is now installed and the printer queue will appear.